Slide Out is Slide Out. All of the inbounds slides funnel into this egress. It initiates as a snow bridge over Slide Brook with one bank that rises sharply forming a ramp. Think of a “V” with the bottom third filled in. Depending on snow depth and time of year, the first section of Slide Out can be an easy ramp up, or a near vertical wall after a compression loaded hole. Over the years many leg weary slide skiers have pancaked into the head of Slide Out or flayed off the ramp into Warren Miller worthy yard sales. It’s easy to think you’ll need to accelerate through the bottom of slides to make it up the Slide Out ramp without having to sidestep. The key to Slide Out is carrying just enough speed to make the ramp, while sucking up the compression as you move over Slide Brook. Do not congregate above or in the landing zone of the ramp out. 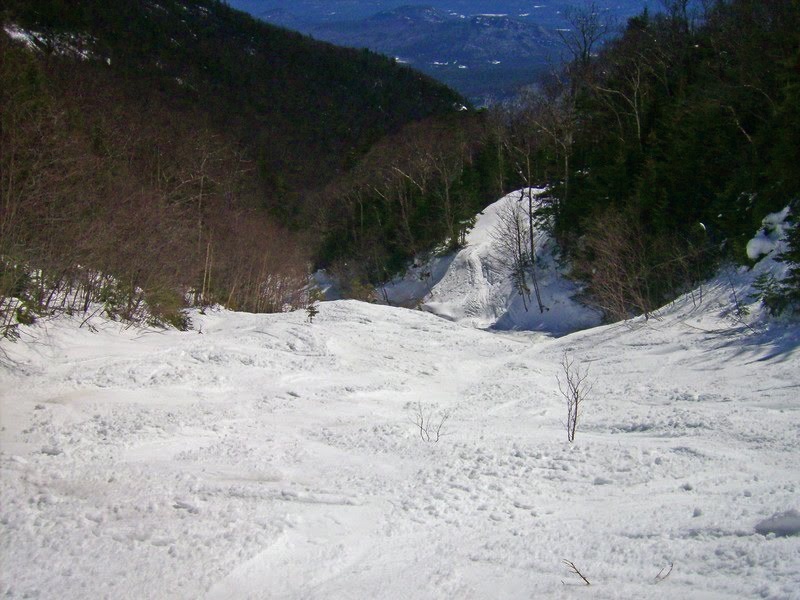 Once safely clear of this feature, Slide Out is nothing more than a snow-cat access road that gently descends back to the crossover loop below ladies drop on Lower Skyward. It has just enough pitch that you don’t have to skate or even pole to get back to Lower Skyward. You just point them straight and pick up speed all the way out. There are a couple fun boulders along Slide Out, small enough that the flat landings don’t do damage. Please go one at a time through Slide Out for safety. Note that the lower portion of Slide Out is clearly visible from the Summit Quad.